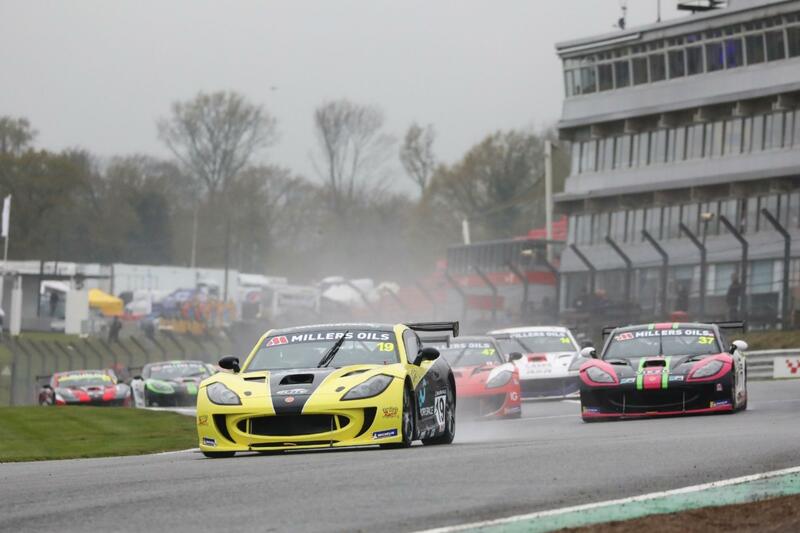 Reece Somerfield, Harry King and Will Burns took a victory apiece as the Millers Oils Ginetta GT4 SuperCup served up a thrilling weekend of action at Brands Hatch. A talented field of 20 drivers assembled for the opening meeting of the 2019 season and it was clear from the off that it was going to be a competitive weekend, with less than a second splitting the top 17 drivers on the timesheets in qualifying on Saturday. It was second year contender Harry King (Elite Motorsport) who led the way as he secured his third pole position in the championship, albeit by the narrowest of margins with Will Burns (Rob Boston Racing) just seven hundredths of a second adrift. The opening race of the weekend proved to be one of the most intriguing in recent GT4 SuperCup history, with some sudden rainfall as the field collected in the assembly area leading to a tricky decision on tyres and a near 50/50 split on the grid between slick and wet rubber. When the lights went out to get the first race of the season underway it was immediately clear that wet tyres were the right choice and the main beneficiary was Reece Somerfield (Privateer), who stormed from sixth on the grid into the race lead in just two corners. With the remainder of the Pro Class field all opting for slicks, it was a number of Am Class contenders that rose to the head of the field, with Darron Lewis (Team Hard) ending the opening lap in second overall ahead of James Kell (Rob Boston Racing). Following a safety car interlude, Somerfield remained the man to beat and he used all his experience behind the wheel of a Ginetta G55 to take a superb second career victory in the GT4 SuperCup – his first coming at the same circuit during the 2015 season opener. Behind, Lewis completed a sensational debut in the championship with second overall, the fastest lap of the race and the Am Class victory ahead of fellow class runners Kell, Lee Frost (Declan Jones Racing), Paul Taylor (Team HARD) and Lucky Khera (Declan Jones Racing). 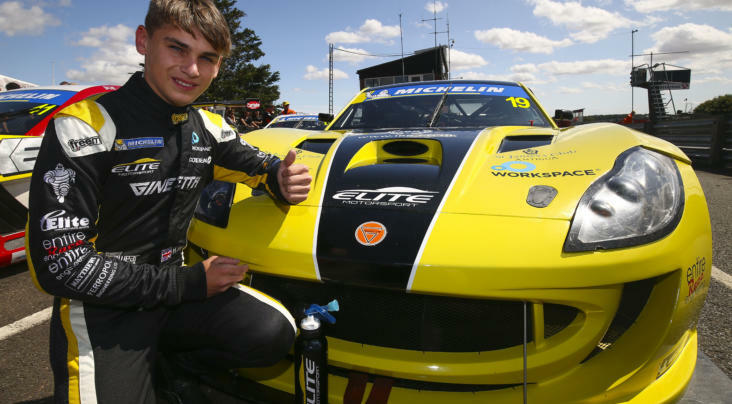 King and Tom Hibbert (Triple M Motorsport) joined Somerfield on the Pro Class podium after finishing seventh and eighth overall respectively, with GT4 SuperCup debutants Mike Epps (Team HARD) and Peter Bassill (Century Motorsport) rounding out the top ten. Later that afternoon the field re-assembled for race two and Somerfield briefly led away from pole position before King seized the advantage into Druids. He went on to successfully negotiate a safety car restart before breaking clear to a fifth victory in the GT4 SuperCup. It wasn’t as clear cut behind however as Somerfield and Epps enjoyed a thrilling battle over second position. Battling wheel-to-wheel at 120mph, the duo were inseparable as they ran side-by-side for a number of laps before Somerfield emerged in front. 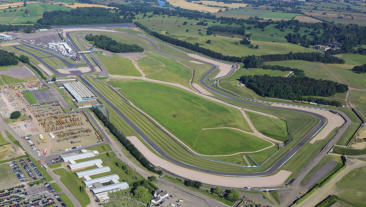 Third position marked a debut podium finish for Epps, while Hibbert fended off the attentions of Burns to take fourth. Behind those two, Carl Shield (AK Motorsport) completed the top six with 2018 Ginetta Junior race-winner Fin Green (Total Control Racing) in hot pursuit. The drive of the race came from debutant Nathan Heathcote (Century Motorsport) who stormed through from ninth in the Am class on the grid to the Am Class lead in just five laps. With his Rallycross experience helping him excel in the tricky conditions, he went on to a class victory. Two more drivers on the move were Dan Kirby (Rob Boston Racing) and G40 Cup graduate Jack Oliphant (Century Motorsport), rising from seventh and tenth respectively at the start to complete the Am Class podium; the latter being another to pick up silverware on his debut. The final race of the day took place in front of a huge trackside audience and the live ITV4 television cameras, with the reverse grid placing 2016 GT4 SuperCup vice-champion Burns and Taylor on their respective class pole positions. Burns went on to lead proceedings from start-to-finish on his way to a fourth career victory in the championship, while an early move on Somerfield earnt King second position to complete a podium hat-trick for the weekend and secure him the early championship lead. Somerfield followed him home to complete his best ever weekend in the championship with a third podium finish of his own ahead of Epps. Green took his best result of the meeting in fifth, while sixth overall went to Heathcote as he secured a second consecutive Am Class win. Championship stalwart Colin White (CWS Motorsport) superbly fought his way through from 20th on the grid to seventh overall and second of the Am contenders, with the class podium completed by Lewis for his second piece of silverware of the weekend. Other notable performances came from two debutants, with Simon Rudd (Rob Boston Racing) capping off a competitive run in ninth and Carl Garnett (AK Motorsport) notching a top five finish in the Am Class, while Tom Barley (Team Hard) will be eager to bounce back next time out after a tough outing. Pro Class Top Three: 1. Harry King (Elite Motorsport), 97pts; 2. Reece Somerfield (Privateer), 92pts; 3. Mike Epps (Team Hard), 70pts. 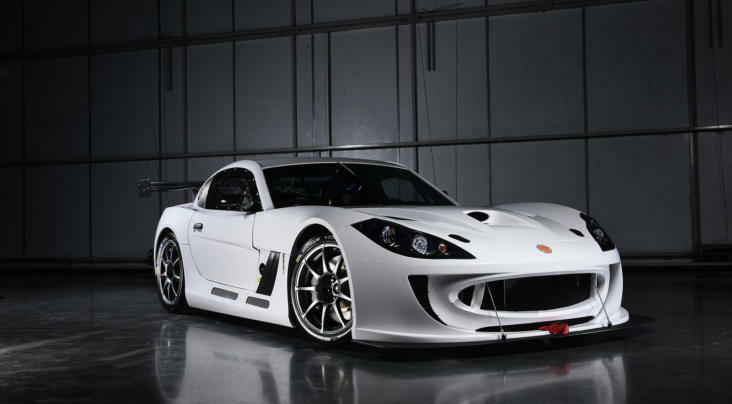 The 2019 Millers Oils Ginetta GT4 SuperCup continues in three weeks’ time (27/28 April) at Donington Park in Leicestershire.